Disruptive innovators provide the creative solutions to most of the problems an organization faces. Yet they are seldom listened to by the community. 1 hr introductory seminar. Classes forming soon. We can also provide this seminar to groups of 10 or more. Email us for pricing information. People just do not listen to your great ideas. They actually ignore them or act derisively. Yet sometimes they do adopt them, although often you are not given the credit. Relax. You are not crazy nor are you doing anything wrong. That is actually how most human social networks deal with change. Recognizing the underlying processes that every community proceeds through when adapting to change will help you understand why they do not listen. It will also give you the tools that will make it much easier for them to listen to you and for you to actually get credit for you ideas. We can help you use the knowledge of human social networks to get your innovative ideas a fair hearing. Human social networks often determine how rapidly information flows across the community. 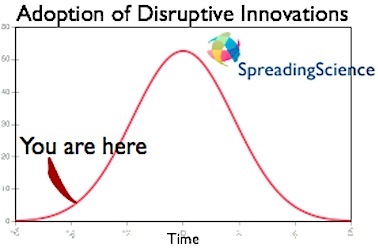 While it is often the disruptive innovators that introduce new ideas, it is often the majority, the doers of the group, that determines whether they are widely used. Disruptors and doers have very different approaches when it comes to adopting change. The former loves new things and adapts rapidly. The latter has seen too many ‘innovations’ that simply disrupt their ability to get things done. This seminar will show you how innovation traverses a community. It will examine why disruptors are critical to adaptive change but how that very disruption can hamper the acceptance of their ideas. It will explain why disruptors are not often listened to by people in authority, as well as some tips to help overcome this problem. After this seminar, you will have a basic understanding of why an organization will not listen to your innovative ideas and how you can use that knowledge to make them listen. Pingback: Messages to my mother I « A Man With A Ph.D.